The Shelby Mustang isn't just another classic Ford Mustang. And Carroll Shelby isn't just a famous race driver who wore bib overalls. Whether your favorite is one of the first GT350 Mustangs, or a wickedly fast 2010 Mustang GT500 these cars are all about excitement. In 1964, Carroll Shelby was asked by Ford to create a hot rod version of their incredibly popular new 1965 fastback Mustang and make it race competitive. Shelby, whose reputation as a winning race driver in everything from drag racing, to formula one was the man to do it. Using his seat of the pants experience in the drivers seat, combined with his proven ability to produce a car that could win races, made him the right choice for the job. What car or cars did he produce? The one that you may be most familiar with, is one other than the Shelby Cobra. Carroll Shelby, working with England's AC Cars, stuffed a 260 cubic inch Ford V8 into a little 2 seater British sports car known as the AC Ace. The result was a sports car that was light, nimble, ferocious on the race track and sold like hotcakes. Before his efforts took him to create either of the Shelby prepared Mustang or the Cobra, he created another British/American hybrid. Being a big believer in power to weight ratio, Carroll took the small and underpowered Sunbeam Alpine and stuffed a 260 cubic inch Ford V8 where a heavy and anemic 4 cylinder previously sat. And if you've seen the old Get Smart re-runs, you'll recognize the car as Maxwell Smart's Sunbeam Tiger. Having had the pleasure of a test race in one of these cars, I can tell you, there's no doubt how the Cobra got its start! 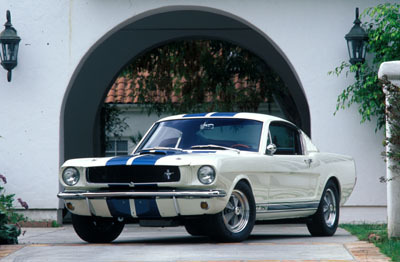 The very first Shelby Pony Car debuted in January 1965, complete with a white exterior, blue Le Mans stripes and a black interior. Shelby tweaked the already impressive 289 high performance V8 from 271 to 306 horsepower and made extensive changes to the other mechanicals to ensure that his creation ran as good as it looked. Follow the link for full details on the 1965 Shelby Mustang. While Ford was pumping up its Mustang gt sales with the humongous big block 390 cubic inch engine seen in the Bullitt car, Shelby had a few more tricks up his sleeve. Borrowing the biggest police interceptor engine from Ford's full size chase cars, Shelby performed more hot rod magic and created the hugely popular GT500. 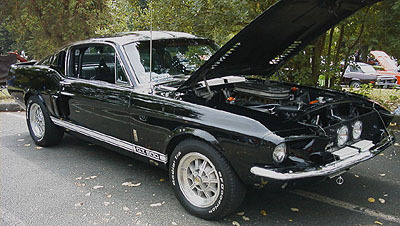 Here's the full story on the 67 Shelby GT 500. The 2010 Ford Shelby GT500 is an amazing piece of automotive excellence, combining performance and style into one exciting package. 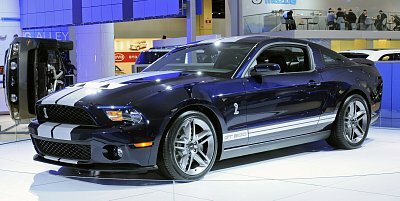 With it's aluminum V8, pumping out 540 horsepower, the 2010 Shelby GT500 is something to see.